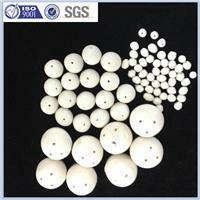 Porous ceramic ball has high stability and flexibility. and improves the void of the specific surface area and lowing resistance. It is a new developed product in our company , and we focus on the centre of the ball to open holes, it has high stability and flexibility. and improves the void of the specific surface area, lowing the resistance of the system..So it can be widely used in oiling, chemical , and natural gas industries.